There’s a saying among soccer pundits: Form is temporary, but class is permanent. We here at InsideHook like to dress ourselves by a similar mantra: Trends are temporary, but style is permanent. Because certain elements of menswear — a properly fitted suit, a durable pocket knife, an accurate wristwatch — don’t require reinvention. They look good, always have, and always will. Why try to rewrite the formula? That said, there’s always room for small improvements. The same suit … in a lighter fabric. The same blade … built from fewer pieces. The same watch … with a clever light that illuminates its dial come sundown. Below, you’ll find 10 such products, which we’ve curated in partnership with our friends at Timex — makers of said watch, and the clever light that comes with it. What is a wristwatch, at its most fundamental? An instrument that measures the progress of time. Ironically, it’s an instrument that has itself resisted sweeping updates over the decades — because it didn’t need them. 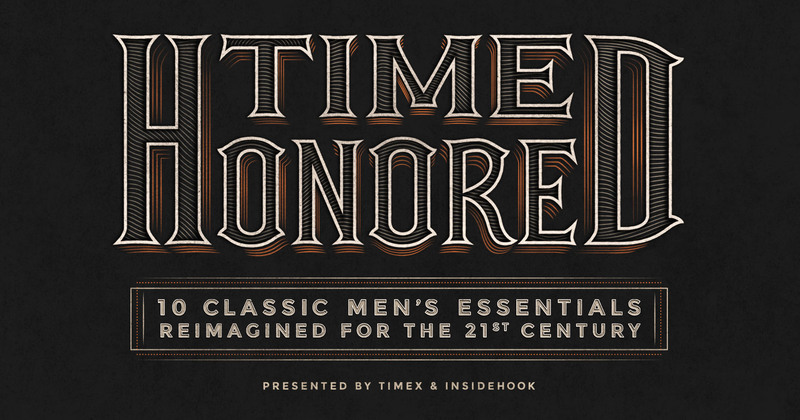 Take the Timex Easy Reader, now available in a special 40th Anniversary Edition. First introduced in 1977, the watch remains near perfectly intact today: clean, classic dial with legible indicators, genuine Horween leather strap, and a quartz analog movement water-resistant to 30m. The most significant update? Timex’s signature INDIGLO night-light, which here lights up to reveal a hidden “40” logo celebrating the watch’s storied four-decade run. And at $69, Timex still parts with them at a price that can’t be beat. “The pen is the tongue of the mind.” Not your smartphone, and not your Twitter. A pen, and the ideas it shares, can last forever — which is what Ian Schon was thinking when he started assembling these heirloom-quality writing implements in his garage a few years ago, working off a vintage Clausing lathe. The design remains the same, but these beautiful instruments (all made in the USA) now come shaped in aluminum, titanium, stainless steel, brass and bronze casings. They’ll start polished, and develop a patina over time, which mean the mark you’ll leave can be passed down for generations. Simple isn’t always easy. But it is always reliable, and when it’s a product like The James Brand Chapter Pocket Knife, it is also very, very handsome. Using D2 blade steel and titanium for the scale handle makes it both lightweight and durable — ideal attributes for an object that cuts things for a living. By minimizing the construction to just a few pieces, James Brand has nearly perfected a time-honored boyhood favorite. The briefcases of old meant business. But they also tended to be stiff, heavy and uncomfortable. In other words, they did their job, but didn’t necessarily go beyond the call of duty. So This Is Ground reimagined the daily carry for a modern worker: beautiful soft shell exterior, multiple interior pockets and complimentary to TIG’s line of groundbreaking cord/tech organizers. No less professional, but certainly more adaptable to today’s world. By now you’ve heard the phrase direct-to-consumer. It refers to a business practice that cuts out distributors, retailers and the rampant price inflation that attends them. Much like Warby Parker did to optics and Harry’s did to shaving, Paul Evans brings the direct-to-consumer model to high-end men’s dress shoes. They use the same materials (French and Italian calfskin) and construction methods (Goodyear welt) that have long been standard for shoes that go in the $800-1,000 range. Only difference? They sell their oxfords, boots, brogues and loafers for about half that. “You get what you pay for” is an expression that certainly applied to cashmeres sweaters past. But Naadam found a way to circumvent the price point: getting stranded in the Gobi desert for a month. There, founder Matt Scanlan developed a relationship with goat herders in Mongolia, whom he now invests in through a non-profit. His company gets first dibs on wool, bypasses the middleman and keeps the process sustainable. It’s a high-end fabric to be sure, but they’ve swapped indulgence for economy and eco-consciousness. When you pick up a pair of Garrett Leight sunglasses, you’ll notice the weight. It’s not that the frames are heavy, per se: it’s that they’re substantial. Solid. Robust. That’s because GLCO uses a higher grade acetate than most, making their shades way more durable (and comfortable) than any other pair you’ll wear. It doesn’t hurt that the glass is so clear you’ll wonder why God didn’t make our eyes this good. Take a look at your shaving kit. Then next time you visit your old man’s house, take a look at his. The difference? Anywhere from one to five blades, not to mention a host of cooling strips and other add-ons. Bevel proves none of this is necessary. Their re-engineered, double-edge safety razor allows even the most sensitive epidermis a smooth shave, thanks to a perfectly weighted handle and single razor-sharp blade. You can’t walk around trimming willy-nilly like an electric, but after one morning with this, you’ll appreciate the ritual.